Drag and drop is an essential feature on the Mac that is used frequently for interactions in the Mac OS Finder and throughout other applications, so obviously if drag and drop stops working seemingly out of the blue, you’ll want to resolve that fairly quickly. While this is a somewhat rare issue, a failure of drawing and dropping capabilities does happen frequently enough that we get questions about it, and it’s thereby worth covering. You’ll find that if you can’t drag and drop at all, troubleshooting the issue is the same regardless of whether you use a trackpad or mouse with a Mac, so read on to resolve the issue. For best results you’ll probably want to try these in order, they’re arranged in order of simplicity to slightly more complex. WAIT! First, Check the Hardware for Gunk & Grime! Before we get started with any of the software based troubleshooting tips, check to see if there is any material, gunk, or grime buildup on the surface of the trackpad, or in the tracking surface of the mouse, and in the buttons. If there is, clean that off first, as physical obstructions can definitely cause weird behavior with input interfaces. If you’ve done that and you’re certain it’s not the cause of an inability to drag and drop, carry on with the tips below. Wait! Is the Mouse or Trackpad Bluetooth? If the Mac Trackpad or Mac Mouse is Bluetooth, try simply turning Bluetooth off, and then turning Bluetooth back on again. An easy way to turn off and on Bluetooth is through the Bluetooth menubar item near the top right corner of the Mac display. You can also toggle Bluetooth off and back on again from the Bluetooth preference panel within System Preferences, accessible from the  Apple menu. Sometimes simply toggling Bluetooth off and on again resolves quirky issues including a failure of drag and drop to work. You will also want to make sure the batteries or battery of the Bluetooth mouse or trackpad is charged and they are working, if the battery is low you may notice weird behavior like some mouse and cursor activity not working as expected. If you’re still experiencing issues with drag and drop on the Mac, proceed with the next set of troubleshooting steps. 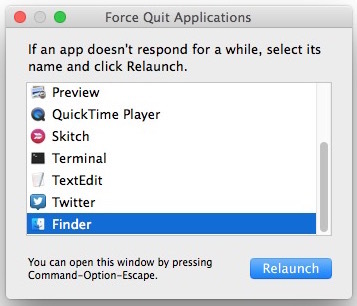 Rebooting often works to resolve drag and drop issues when restarting the Finder has failed. This is particularly true if you’re one of us who basically never reboots their Mac. Drag and drop working in Mac OS X now? Great! If not… well we have yet another solution, so fear not! If you have already forced the Finder to relaunch and rebooted the Mac but you’re still experiencing issues with dragging and dropping, it’s quite likely the problem comes down to a preference file. Thus, we’ll trash the preferences and start anew, which is an effective technique for troubleshooting strange behavior for a Mac mouse and trackpad, and then reboot the Mac again. Once again, try using drag and drop where you were experiencing the original failures in Mac OS X, it should work just fine at this point. Keep in mind that if you trash preference files you will lose any customizations you had set for those devices, so in this case you may lose a customization to tracking speed, force touch, mouse clicks, and whatever else you adjusted for a mouse or trackpad. 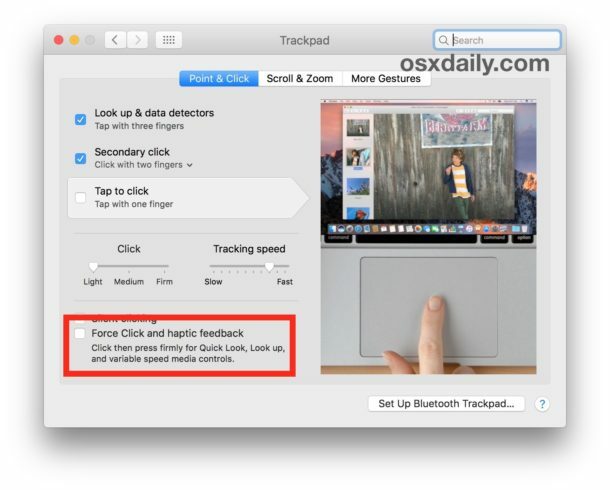 If you use a trackpad or a Mac laptop, some users have found the force click and haptic feedback mechanism interferes with the drag and drop capability of Mac OS, particularly with certain apps. Often the haptic feedback / force click issue with drag and drop manifests as when you are attempting to drag and drop something with the trackpad, you feel a strange delayed double-click sensation and the item is then unselected or the action stops. Did one of these solutions work for you? 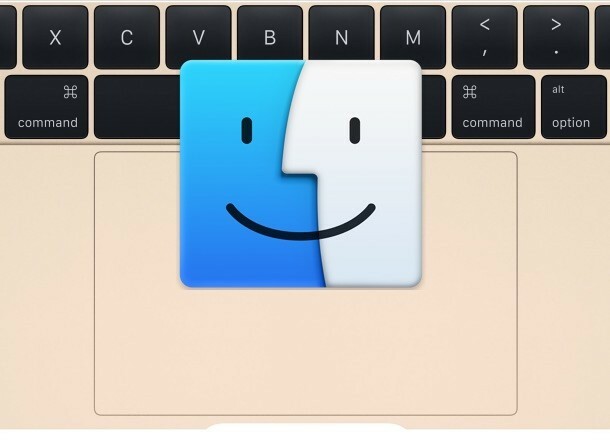 Do you have another solution or fix for when drag and drop stops working in Mac OS X? Let us know in the comments! 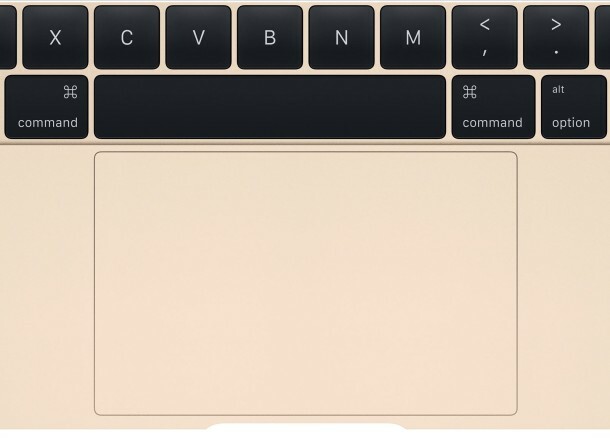 Ah, but what about doing drag & drop with the Force Click trackpad on the new MacBook ? Drag and drop works fine on the new Mac Force Touch trackpads, use it frequently, though when you first encounter it on a new Mac, it does take a little getting used to. The secondary force click is smart enough to not activate while dragging, too. Anyone using AirParrot will have this problem. Only fix is to uninstall, not delete, the app completely. Good to know, but it has not happened to me, yet. However, a maybe related problem that makes the drag and drop really needed is the following. I want to send an email to someone, and I want to include a file F. In the mail program I go to the icon that makes including possible, click on it, get Finder, and want to choose the folder X to find and choose file F there. But what Mail does is imediately include folder X. So I have to delete it and then drag and drop F to the email. This was not the case some updates of OSX ago, but it keeps on happening. A bug in my computer, in mail, or in my brain? Wow… this tip works for me. My new MacBook Retina got this issues. I turned ON the bluetooth and OFF again. Drag and Drop now working fine! Turning the bluetooth on and off worked for me. It sounds misguided to suggest this is due to a faulty trackpad when a number of people are having the same problem. Ditto what KrazyKags says. Followed Apple’s advice and that of others, and then I turned Bluetooth off and on … without restarting, drag & drop started working. Toggling bluetooth worked for me too. Really weird that this solved the problem! This worked for me too. Does this mean the machines with this issue are faulty? It could simply be a defective trackpad. Your suggestion of removing the .plist files to correct for failed click and drag worked like a charm. Thank you. Or… it could be the mouse itself. Just a few minutes ago i had this problem. I pried up the mouse button, blew it out, and then put the mouse button back down and clicked a few times forcibly. comment, worked. The simplest fix too. Thanks so much! Forcing FINDER to close and reopening solved the issue. Who would have thought something as simple as relaunching the finder would solve what was causing me so much grief and wasted time. These are not solutions, they are workarounds for a problem that will keep happening. — and well, I understand the concept of literally just erasing all the preferences/setting involved with the problem, but it just didn’t seem optimal to me, as I like my preferences and it would be tedious and cumbersome to get everything back to my own settings. ->CHANGE THE VALUE FROM ‘NO’, TO ‘YES’. ->SAVE FILE, CLOSE IT, AND RESTART COMPUTER. Note that there’s different little variations of this dragging & dropping issue that brought us here. So if you’re using a mouse, or a bluetooth trackpad or something, look for the appropriate preference label– they’re usually named in a self-reflecting manner, so don’t change something if it’s just named ‘kinda’ like what you’re looking for. Can you explain how to change the value please. I found the file, opened it but can’t seem to find the value. Thank you so much! Suggestion #1 was the remedy for me! My problem is that drag and drop is intermittent. I can drag the files, but the underlying folder will not highlight, so I can’t drop the files into that folder. I think sometimes, the drag itself does not work either. This is just a finder problem. I have a 2015 Macbook Pro and am up to date on OS Patches. When I have the problem, I find it will sometimes go away if I close finder windows and re-open. I agree with Bill that none of the solutions here are really solutions, just work-arounds for Apple software issues that should not be happening. Brand new mac powerbook with OS X capitan. Drag and drop keeps failing. Re-launching the finder and restarting every 5 minutes is not a viable option. Middle of master’s thesis and trying to reorganize files – a nightmare. I deleted all 3 plists, and restarted the computer. It’s still not working. bump on the the last couple of messages. using the trackpad i select a file in finder and hold using one finger, attempt to drag it into another location using another finger. sometimes it works, sometimes it doesn’t… sometimes it seems to depend on which direction i want to drag it, so i have to trick it into doing what i want (a common theme with macs in general). dragging works fine outside finder. seemed to coincide with upgrading to 10.11, so that was some upgrade. THANK YOU!!! The Spring-loading deselect seemed to do the trick!! The Spring-loading deselect seemed to do the trick!! Ok so you can use copy and paste, or cut and paste instead? From the Edit menu. I had trouble with the drag and drop not working and it ended up being gunk on the track pad, so definitely check that before you make any significant changes to your Mac! Wiping it up with a simple wet wipe and letting it dry will do the trick. Thanks for sharing the tips! Relaunching the Finder Window solved the problem. Thank you. Relaunching the finder worked perfectly. Yes, relaunching the Finder did it for me too! Thanks. Trust it works for you. I don’t know what unset this setting, it happened all of a sudden out of nowhere for me. wish u’d been at TOP of list b4 i tried everything else that did not work. Urs worked like a champ. nowif i could just get the space bar to work better…..
EGAD! ’tis always something, eh? I found it too! Thanks so much! Ok, my problem is even simpler. When drag and drop doesn’t work, where the heck files go ??? I have no more neither in the original folder nor in the destination (although apparently it highlighted it before moving) – thankfully it’s “only” a video I can download it again at worst, yet it’s anyway upsetting ! ps I have a wireless apple mouse – no idea how do you call it yet it’s Mac’s original mouse. I am having some trouble with drag and drop since I updated to macOS Sierra. Everytime I am dragging photos, videos or any other file to any app opened in the dock (like finder, final cut pro x, messages, mail) it works for the first time, then the second time the app just blinks but doesn’t come up. So I have to minimize all other windows that are opened to be able to drag and drop. It is so annoying. Does anyone have the same problem as me? Yes I think I have the same problem on 2 of my Mac’s after upgrading to Sierra. I find that if I double click my mouse (in fact I using a Wacom Tablet) I can get the drag select to start working again, and I can easily break it again by double clicking. It’s a real pain. How I hate, hate, hate planned/forced obsolescence and the feature creep in software. I NEVER had this problem with Snow Leopard, even if I didn’t reboot for weeks, if not months. But I had little choice but to upgrade after apps (e.g., Chrome, R) stopped supporting it. El Capitan has been issue after issue like this. Spotlight is so much slower, Launchpad is a joke of sluggishness, and the new side-by-side feature sometimes hangs the machine so as to be unusable. The only benefit has been the ability to run newer software, but I can’t help thinking the world would be a much better place if Apple just stopped messing with Snow Leopard and all the latest apps continued to support it. Thanks very much for posting this solution. In my case it was a question of click and HOLD – the mouse wouldn’t let go! (A Logitech wireless mouse on a Mac Mini, El Capitan). No trackpad, but I went through the plist deletion solution, chucking out any drivers of mice etc., and hey presto, after a reboot the mouse was back to behaving properly. Many many thanks – it was driving me nuts! Simply replacing the batteries on my cordless mouse solved the problem. I could still point and click before, but not drag. Use the touchpad with three fingers to test before you invest in new batteries. Great Luck!!! Using new (late 2016) MacBook Pro and sierra. Thank you very very much! Your solution works. THANK YOU!!! I tried a bunch of things in the article and comment, and this one finally worked. I appreciate you taking the time to post what worked for you. OMG…after reading every suggestion, your’s did the trick!!!!! Five exclamation marks doesn’t begin to describe my level of excitement!!!!! I solved the drag and drop problem another way on my MacBook Pro, Sierra os. By chance, I discovered that it usually works if I select the file using less pressure on the touchpad than usual. it worked just like you said, relaunched finder and I dragged and dropped like normal. thanks a million I don’t shut my computer down much but will start doing it more often. This will reset the bundle bit on the Desktop folder. I had a problem closing the Finder window and was unable to move icons on the desktop. I tried method one (force relaunch of finder) and it worked. Thanks. Very recently I have clean installed my MacBook with OS Sierra 10.12.4 where this drag and drop using finder failed completely. I tried all the method given in this site, but nothing solved the issues. System Preferences > Accessibility > Trackpad options > enable dragging without drag lock. At least that’s one place to find an option on this. In MacBook with OS Sierra 10.12.4 where this drag and drop using finder failed completely. I am only recently having issues with Drag and Drop. I have tried the methods suggested without the issue being solved. In Finder … If I drag a .pdf file from my download folder to hover over the documents file … nothing happens, except the red pdf changes to silver and the document folder won’t open and expand to accept the new file. Thank you so much! First thing you suggested worked a treat! I’m having the exact same issue as Sharon. 2016 macbook pro with a new ‘stupid charger access on bottom of mouse’ mac mouse. Drag and drop works but I can’t navigate through multiple directories before dropping. I have to move a file one friggin’ level at a time, or open two windows side by side… insanely frustrating. Yes drag and drop on Mac requires you to click and drag from one folder to another, often with two windows side by side. That’s how it works. you click, drag, hover (the file system then moves you into the folder you’re hovering over after a sec), so that you can drop in a sub directory, or continue to hover and navigate until you reach the place you want to drop. Just bought a new 2015 Mac Pro and have issues with try to drag and drop items from folder to folder or to a software. could this be the reason I’m having these drag and drop issues? and how do I solve it? i couldn’t find that file either. deleted the rest, followed instructions. still not working here. your post was 2 months ago, did you find a solution? my issue is drag and drop files will leave a file, but it will not open due to “unidentified developer.” so it may as well not be dropping anything. Ok, I deleted those .plist files and now even the “click” function on my MacBook Air stopped working. Aaaaaargh. NOPE, NOTHING WORKED! Still can’t drag and drop after trying everything! Can’t stand my MacBook Sierra and ready to go back to PC. Terrible computer. Thanks for your advice. It worked. I can finally drag and drop files on my new MacBook Pro! After all the troubleshooting tips from the post and then from everyone’s response it WAS the trackpad being dirty, even tho i cleaned it off. I just needed to wipe it down with some pressure with a dry cloth and voila it’s working again. Problem solved with restarting Finder; thanks!! I notice many of those plist files are followed by identically named .lockfile files. Shouldn’t those be deleted at the same time? Not sure about their significance. Please, I followed through in deleting the suggested plist file(s) from the user Library Preferences folder. However, upon rebooting my macbook pro (mid 2010; macOS Sierra), the trackpad cannot click on anything (folders, tabs, etc) eventhough the cursor is present and can move about. Furthermore, since I can’t click, I cannot open the trash to put back the deleted plist. Please what should I do to restore the trackpad to work normally. Having the same issue with drag and drop: can’t drop a file in another subfolder (because the folder won’t open when I drag the file to it), but so far none of the suggestions have worked for me. Very frustrating. By the way, the com.apple.preference.trackpad.plist file is missing in my library (the other four are there). Does this provide a cue, perhaps?? can’t find the Plist files you suggest – have tried searching in the way described but they don’t seem to be listed – any thoughts?! I did everything I read here, and finally stumbled across something that worked. I found a blank area on the desktop, right clicked, and selected “Show View Options.” Locate the “Sort By” option, select “None.” I have no idea how or why this setting was changed in the first place. Very frustrating. Discovered events with “/” in the title won’t drag to a folder. Removing the symbol resolved this problem. Thank you for the advice. I had trouble to drag and drop folders from a memory stick to hard rive in Finder. The advice to disable Disable force click and haptic feedback did the trick! Yes, the haptic click being enabled was the culprit. I could not click and drag files or folders. What an incredible annoyance. Thanks Apple for yet another (another! (did I say another!?))) needless “feature” that broke something that was working just fine in every release before it. Is there a permanent fix? I am on Yosemite, don’t take any of Apple’s updates, but this is the only thing that is not working properly. Have had to do the plist trashing a half dozen times in the last few months – very frustrating. Sadly none of the steps in this article worked for me. However one of the commenters tips on turning on and off the bluetooth did the trick! Thanks Joy! Thanks for the feedback Emma I’m glad to hear that you got your drag and drop working again! I have updated the article and added the Bluetooth trick to the list of troubleshooting steps for drag/drop issues on the Mac, cheers! For me it was a matter of switching off Force click and haptic feedback – thanks!